Durham protest in solidarity with Palestine | Fight Back! Durham, NC - Over 60 people gathered at a busy intersection in downtown Durham on Aug. 8 to show solidarity with the Palestinian people. Protesters chanted "Free, free Palestine!" and "End the occupation now!" as hundreds of people witnessed the rally from the road, many honking car horns in support. 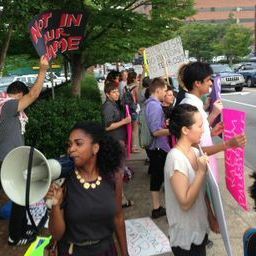 The rally, organized by the Triangle Antiwar Committee, is the latest in a wave of protests in the area opposing the ongoing Israeli attacks on Palestinians in Gaza and the West Bank. Among the speakers was Genna Cohen, an organizer with Jewish Voices for Peace’s campaign to demand that Durham cut ties with G4S, a private security contractor. "Durham should not do business with a company that profits off the occupation of Palestine," Cohen said to cheers from the crowd. According to the campaign organizers, G4S profits from providing security services for military checkpoints, Israeli detention centers and illegal settlements.